The potential for corporate sourcing of renewable energy in Europe is significant and largely untapped. To support its growth and bring a new stream of revenue into the European electricity market, it requires a consistent regulatory environment and awareness of this opportunity needs to be raised across a range of different stakeholders. 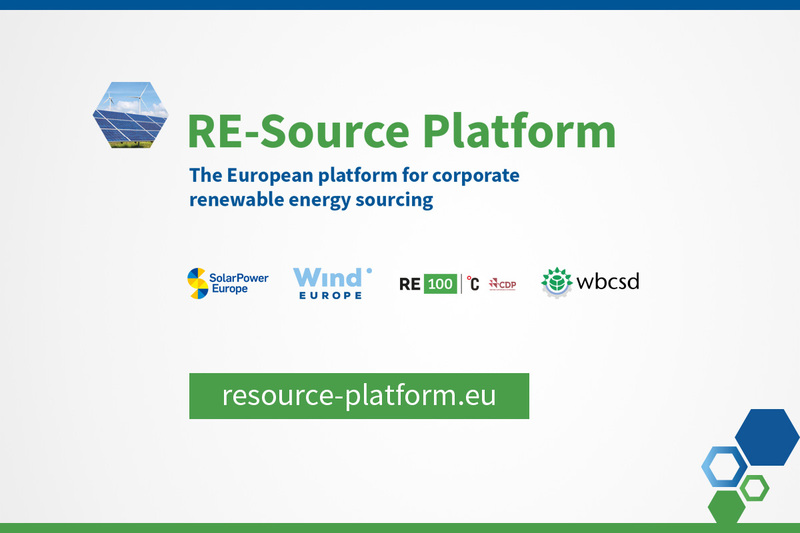 SolarPower Europe and WindEurope, RE100 and WBCSD have therefore established the RE-Source Platform. It is the first and only multi-stakeholder platform in Europe bringing together the interests of both renewable energy buyers and sellers. The RE-Source platform will pool resources and coordinate activities to promote a better policy framework for renewable energy sourcing, at EU and national level. “Following our hugely successful RE-Source event in October 2017, which connected over 500 large corporate players and renewable energy companies, it made perfect sense for us to launch this Platform. Given also the current update of the EU’s Clean Energy Package, the time is right for us to work together to remove barriers to companies wanting to power their operations with renewable energy” said James Watson, CEO, SolarPower Europe. “Corporate Renewable PPAs (Power Purchase Agreements) provide clean, reliable and competitive power for industry across all sectors and increasingly in energy-intensive sectors. It’s now a well-established model in many countries in Europe. European industry has signed 1.5 GW of renewable PPA deals over the past four years, 1.3 GW of them with wind energy. The new RE-Source platform will play a vital role in spreading the model to all countries in Europe and to smaller companies so that more industrial consumers can benefit from it,” said Giles Dickson, CEO, WindEurope. “We are delighted to be a founding partner of the new RE-Source Platform. Bringing together our combined expertise, and the buying power of RE100 members, will help us influence the development of a supportive policy framework in Europe, with stronger markets for renewable electricity,” said Sam Kimmins, Head of RE100, The Climate Group. “WBCSD welcomes the new RE-Source platform and we will be delighted to work with our new partners in addition to those who are part of the similar platforms we have established in India and Argentina. RE-Source will help everyone involved in renewable energy transactions to jointly develop innovative solutions for corporate sourcing of renewables in Europe.” said Maria Mendiluce, Managing Director at WBCSD.